If you can engage students in the math that they’re learning, they are more likely to learn it and retain it. 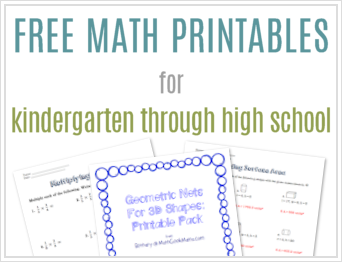 Finding a way to actually engage them, however, can sometimes prove difficult, especially if they already have a distaste for math or have decided they are not a “math person.” There are many ways to try and engage reluctant math learners, but one way that is effective as well as practical is to make math relevant. 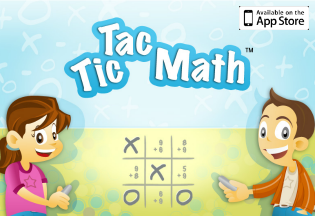 Use the topics, hobbies or interests that they are already engaged with and weave in math learning. Or show them that they are in fact using math already, they just may not realize it. 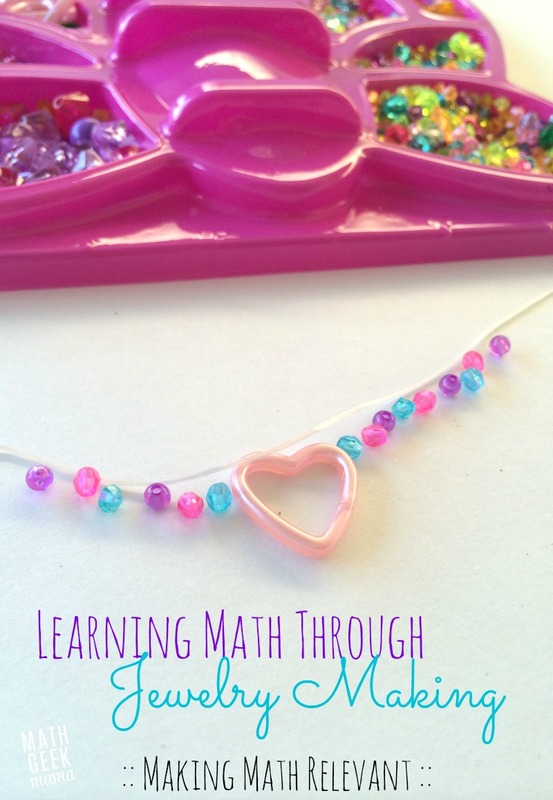 Lately my daughter has been learning math through jewelry making, because it is something that interests her and something she is spending a lot of her time on anyway! 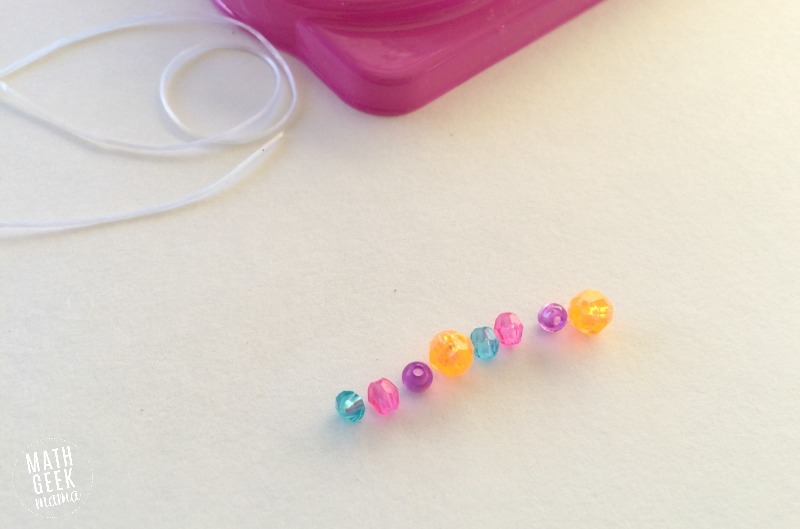 The object of this post is not (necessarily) to encourage you to go teach your daughter math by making jewelry. Though if that is something she loves and enjoys (or you think she would enjoy) by all means, teach her some math along the way! The point is to find ways to explore math with your kids using the things they are already interested in. For my daughter, it happens to be jewelry making. For your kids, it could be sports or cooking or LEGO or Star Wars or reading, or any other number of things! By being intentional about looking for ways math is involved in what they’re already doing or studying, you can increase their number sense and math awareness, as well as help cement important math facts. Showing kids that they can use math to solve a problem in their world is an incredible motivator and will make what they’re learning more meaningful. 1. First of all, she had to learn and practice making patterns. When designing a necklace or a bracelet, she has to create a pattern which can be very simple, or incredibly complex. 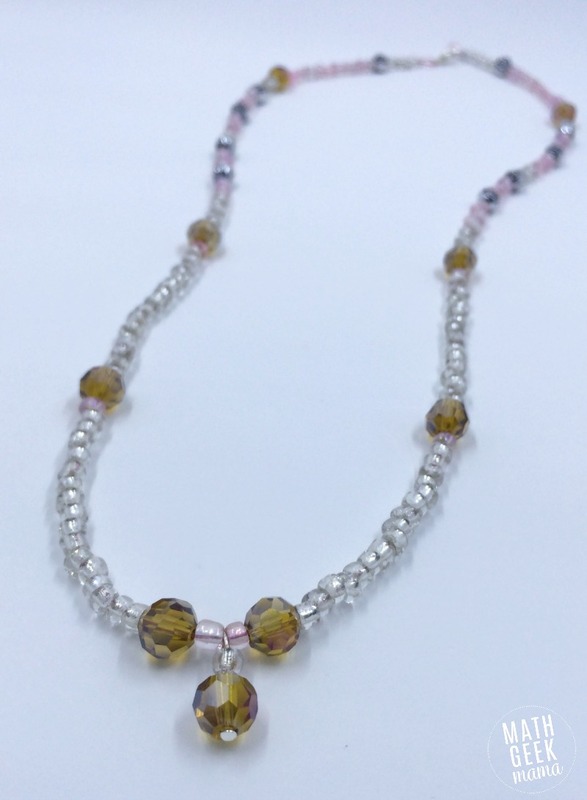 She likes to mix things up and include big beads and small beads, “accent” beads, dangling beads, and so on. This takes practice, but also requires visualizing the finished product before starting. 2. She’s had to learn and apply an understanding of symmetry. We’ve talked about and played with symmetry several times with fun arts and crafts, but when making jewelry, she’s had to actually use that knowledge to create symmetrical and balanced pieces. She’s had to think about the center of a necklace or bracelet and create a pattern that can be going one way on one side of the center, but then is reflected on the other side. She’s also had to learn how to create sides that are equidistant from the center so that the necklace is balanced and hangs properly when you wear it. 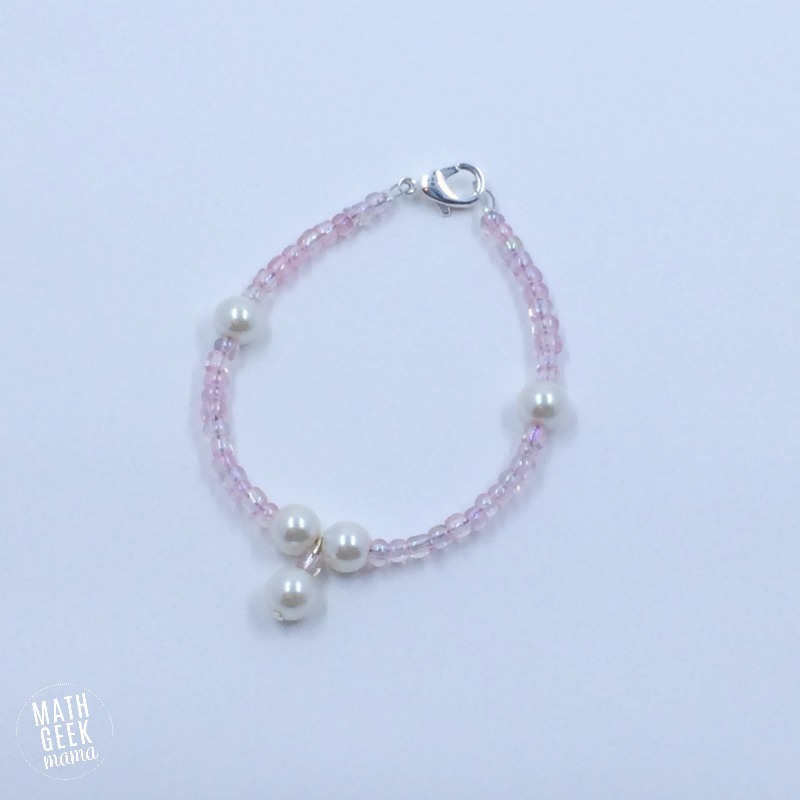 When she first began making jewelry, she didn’t pay much attention to the size of wire that she cut. This caused problems though, because sometimes a necklace would end up too short or a bracelet would end up too long. So she’s had to learn to measure the wire first, and practice using a ruler so that certain necklaces or bracelets can be the same length, etc. 4. She’s learned to count money. She’s enjoyed creating custom jewelry so much, she decided that she wanted to try and sell it so that she could save up to buy a toy she’s been wanting. 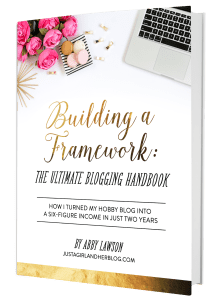 I love seeing her entrepreneurial spirit, and thought it was a great idea and teaching opportunity, so I’ve been helping her hone her craft so that she has quality pieces to sell. This has allowed us to see even more math applications because she’s now counting money and calculating expenses and profits, etc. After purchasing a few initial supplies, I’ve helped her sell some pieces and then use some of the profit to purchase more supplies. We’ve added her sales and subtracted her expenses. She also knows that the toy she wants costs $32, so we’ve explored different ways she can sell enough to make $32 (i.e. how many necklaces and how many bracelets). There is so much more math to explore when it comes to revenue, profit and expenses, but my daughter is still young. If you have older kids, however, and they are interested in business at all, encourage them to try some things out. I bet they would be much more likely to spend time working out math calculations if it’s related to a business idea they’re interested in! 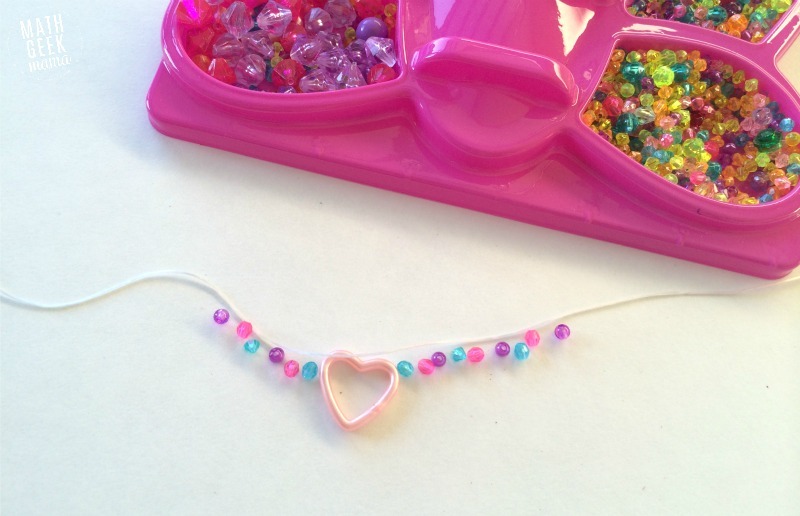 If you have a child who loves art and would be interested in learning to make jewelry, it’s very easy to get started. This kit (or something similar) provides all the basic supplies to get started. And if your child is interested in something else entirely, look for ways to explore math through those interests! Most of all, make math fun!